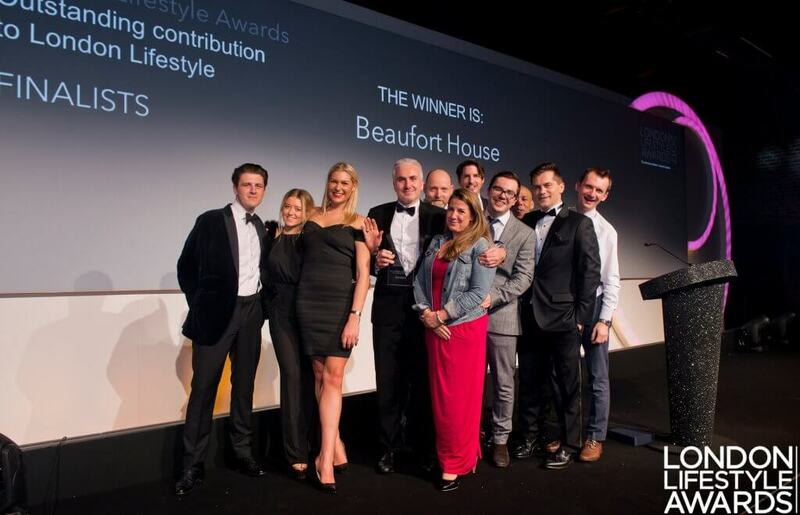 London Lifestyle Awards – Winner! We are thrilled to announce that we were winners at this years London Lifestyle Awards, the ultimate celebration of the businesses, people and places that make London the greatest city in the world. It is a celebration that showcases the very best of London and celebrates the fantastic achievements throughout the lifestyle industry. We were awarded “Outstanding contribution to London Lifestyle” and runner up in the “London Bar of the Year” Award. Beaufort House Chelsea represents everything that is wonderful in the fabulous city of London and winning this award reinforces that Beaufort House Chelsea is known as one of the best venues in London consistently offering excellent service, food, and drink and we are so proud of this recognition of our success. The perfect venue for Christmas Parties in London, Private Dining in our stunning exclusive rooms, Corporate Events, and celebration of any shape or size, Beaufort House is renowned for delivering the very best events with excellent menus, a stunning wine list and delicious cocktails, and this is reflected in the reviews we have received over the years via TripAdvisor and Google. Contact us today to book your private event, whether a personal celebration, Christmas festivities or corporate event.